Helium gas is used in a wide range of applications due to the unique properties of noble gas. The below diagram shows the main applied fields where helium gas is used. Each applied field relates to one or more helium gas properties. Helium gas as an excellent coolant used for cooling applications such as MRI (magnetic resonance imaging), nuclear magnetic resonance spectroscopy (NMR), particle accelerators, large internal collider (LCHR), quantum superconducting interference device (SQUID), paramagnetic electron spin resonance (ESR), superconductivity magnetic energy storage (SMES), power transmission , superconductivity sensors, mass spectrophotometers, superconducting magnets, strong magnetic separator field, superconducting magnets for fusion reactors and other cryogenics studies. The helium cools the superconductor material at low temperature and cools the supermagnetic magnets at a low and near zero absolute temperature, so the electronic resistance of superconductor suddenly decreases to zero. Very low electronic resistance in superconductors enables them to produce a stronger magnetic field. For MRI equipment in the hospital, as thestrength of magnetic field increases, more details appear in the radiological image scan. Helium is used as a superconductor, since it has the lowest melting point and boiling point in the elements, the helium doesn’tbecome solid at atmospheric pressure and is chemically inert. In addition, helium is a superfluid at the temperature below 2.2 Kelvin. So far, the super-fluid feature has not been used in any industrial project. If the temperature less than 17 K is required, helium as a superconductor can not be replaced in cryogenic applications. Helium gas is the second lightest element after hydrogen and its density is less than air. Therefore, helium was used as a lifting gas for balloons, meteorological balloons, airships and air balloons after the First World War. Helium gas is used as a protective gas in electronic arc welding and plasma arc welding, because it has the highest ionization potential between atoms. The protective atmosphere of the helium gas around the welding site prevents oxidation of metalsin the melting state. High helium ionization potential makes it possible for plasma arc welding to work with strange metals such as titanium, zirconium, magnesium and aluminum alloys used in construction, shipbuilding and aerospace. Helium, as a protective gas, can be replaced with argon or hydrogen, although it is not possible to replace helium with other gases for arc welding of certain materials, such as titanium, because helium is the only gas that is safe to use at high operating temperatures. Helium gas is used in pressure cleaning operations, where liquid hydrogen or other gases are replaced by helium or liquid helium or used other gases. Because helium is the only gas with the lowest boiling point than hydrogen, and helium is inert. Nitrogen isn’t used as a cleaning gas for liquid hydrogen systems, because nitrogen will become solid in these conditions. Helium is used as a cleaning gasin aerospace industry for organizations such as Arizona Space and NASA. For example, in the delta IV rocket, helium was used to preserve pressure in liquid oxygen fuel tanks. When liquid oxygen burns as a rocket fuel, helium is injected into the fuel tank to prevent its collapse. Helium, as a cleaning gas, can be replaced with nitrogen, but it can not be replaced in liquid hydrogen systems. Helium gas is used to detect leakage because it has the smallest molecular size and it is similar to a single atomic molecule. Thus, helium can easily pass through the smallest leakage places. During the leak detection stage, the object is filled with helium and in this case, a helium mass spectrometer is used to detect the leakage place. Helium is used to detectleakage inrockets, fuel tanks, heat exchangers, gas lines, various electronic equipment, television tubes and other manufacturing components. Helium was first used to detect leakage in the Manhattan Project to find leakage in uranium enrichment plants. Helium can be replaced by hydrogen or nitrogen in leakage detection. Helium gas is used as a carrier and cleaner gas in gas chromatography because helium is chemically inert and has a high purity. Chromatography is a series of terms used for laboratory techniques for mixtures separation. Chromatography is widely used for qualitative and quantitative analysis in laboratories and processes. 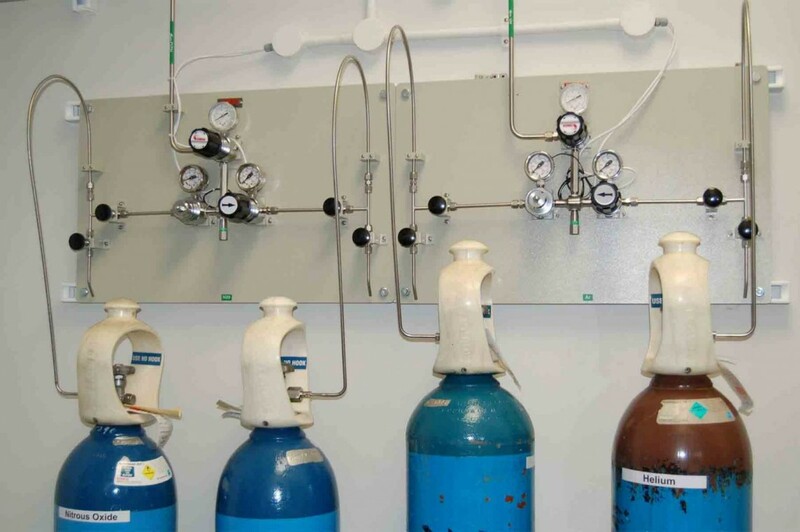 Helium gas as a carrier can be replaced by nitrogen or hydrogen. Helium is used as a protective gas and is much preferred due to its chemical inactivity. Helium is used as a cooling gas because it has a very high thermal conductivity and specific heat in the production of semiconductor materials. For example, helium is used as a liners in the production lines of LCD displays. In another example, helium is used to deal with the frying of tanks during the processing of semiconductor chips. Helium is used as a protective and cooling gas during the growth of silicon and germanium crystals too. Heliumcan be replaced by argon or hydrogen or nitrogen, depending on its application,. Helium is used as a coolant during the fiber optic cable production process, because it has very high thermal conductivity and specific heat. The low temperature and inaction of liquid helium has made it an ideal choice for quickcooling of thesiliconfibers in the cooling tube, which were placed in the form of glass fibers from the glass ingot to the operating location. Helium as a cooling medium can be replaced by hydrogen or nitrogen. Helium is used as a heat transfer conductor in a new generation of nuclear reactors. Helium has several advantages as a heat transfer medium. Helium has a very high specific heat and heat conductivity, so it is one of the most efficient gases for heat transfer. Besides, helium does not lead to erosion and is radiologically inactive (it does not have radioactive isotopes). The general state of helium does not change and it does n’t affect the neutron coefficient. Nuclear power plants that use helium as a heat transfer medium have higher efficiency and higher operating temperatures. Helium as a heat transfer conductor can be replaced with nitrogen. Helium is used for scuba diving in deep water at depth of more than 30 meters, because it has very little solubility in water and blood. Helium /oxygen breathing mixture like Hiller, Tremix, and Heliux are used instead of oxygen/nitrogen breathing mixtures to prevent nocturnal sleep or nitrogen creation in the blood. In addition, helium doesn’t lead to the erosion of equipment and it is non-toxic. The possibility of substitutinghydrogen for helium in scuba diving gas in deep-water has been studied. Helium is used as a powder carrier gas for thermal and cold spray, due to high sound speed and its physical inactivity. Thermal spray and cold spray are commonly known as metal coating spray, which is a surface coating process where a wide range of metals and ceramics can be sprayed on the surface of another material at high speeds to form a metal coating on it. In addition, the high speed of the helium sound makes your sound slightly chirping after helium inhalation.i Helium as a gas carrying powdercan be replaced by nitrogen. Helium is used as an applied gas in lasers and in lighting. Helium-intensifying gas is used in gas lasers, such as helium-neon lasers, CO2 lasers, and metal vapor lasers, such as helium-cadmium metal vapor lasers. Helium is used in laser to create excitement. Different lasers with helium applied gas are used for various applications such as scientific research, interference, holography, spectroscopy, barcode scanning, alignment, laser eye surgery, optical display, printing, typography, applied programs, welding and cutting. Most helium-neon lasers have now been replaced by cheaper diode lasers. In addition, helium is used as gas in gas discharge lamps. The helium emits white to orange. Helium work gas in gas discharge lamps. Helium emits white to orange colors. Gas discharge lamps are used by artists for special lighting purposes. Helium gas as a work gas or resonator is n’t replaceable in some types of lasers. Helium gas is used in solar telescopes. Helium reduces the deviation effects caused by heat between the lenses in some telescopes because,it has an extremely low refractive index and high thermal conductivity. Helium can be replaced by vacuum telescopes. Helium gas is used in some hard drives. Hard drives are filled with helium to acheive high data storage capabilities. Helium has a seventh air density, which reduces mechanical force in air stretching and air cuts. Besides, it allows the rotating discs to get closer to each other. In addition, due to the presence of helium gas, rotating discs have higher efficient energy because they require less engine power and less cooling process. هلیوم عنصری است شیمیایی که با نماد He نشان داده می‌شود و عدد اتمی ۲ دارد. این گاز، بی‌بو، بی‌رنگ، بی‌مزه، غیر سمی، بی‌اثر و اولین گاز در گروه گازهای نجیب است؛ و البته نقطه‌ی جوش گاز هلیوم؛ پایین‌ترین نقطه در بین تمامی عناصر است. بادکنک‌های رنگی؛ علی‌الخصوص آن‌ها که به آسمان می‌روند و اوج می‌گیرند؛ تقریباً دل هرکسی را به دست می‌آورند؛ اما این بادکنک‌های گاز هلیومی تقریباً گران‌قیمت هستند و بسیاری به دنبال کشف این موضوع هستند که آیا می‌توان آن‌ها را در خانه ساخت یا خیر؛ و این مقاله هم به دنبال یافتن پاسخی برای همین پرسش تهیه و تدوین شده است. هلیوم گازی است غیر سمی؛ که خانه‌ی دوم از جدول مندلیف را به اشغال خود درآورده است. این گاز بی‌رنگ و بی‌بو است و به‌علاوه از کربن دی‌اکسید و اکسیژن به طرز قابل‌توجهی سبک‌تر است. جرم مولکولی هلیوم ۴ است، درحالی‌که همین مقدار برای اکسیژن ۳۲ و برای کربن دی‌اکسید ۴۴ است. درنتیجه می‌توان متوجه شد که چرا و چه گونه؛ هلیوم سبک‌تر است از دو گاز دیگر. درنتیجه می‌توان این‌گونه نتیجه گرفت که اگر بادکنکی از هلیوم پر شود؛ شانس پرواز بیشتری دارد نسبت به این‌که از اکسیژن و کربن دی‌اکسید پر شده باشد. بله؛ در بادکنک‌هایی که قابلیت اوج گرفتن و رفتن به آسمان دارند، از گاز هلیوم استفاده می‌شود. این گاز از نوعی فشرده‌سازی همراه با انجماد گازهای طبیعی به دست می‌آید و در فروشگاه‌های مخصوصی در بسته‌بندی‌هایی مشخص و ویژه به فروش می‌رسد. درنتیجه اگر می‌خواهید در خانه یک بادکنک هلیومی بسازید؛ باید یک قوطی گاز هلیوم خریداری کرده باشید. راجع به چندوچون قیمت می‌توانید در اینترنت جست‌وجو کنید. اگر به تولید گاز هلیوم در منزل فکر می‌کنید؛ باید بدانید که تقریباً ناشدنی است زیرا احتیاج به هزینه‌های قابل‌توجه و البته تخصص فراوان در علم شیمی دارید؛ اما ناامید نباشید؛ هنوز هم راه‌های زیادی برای ماجراجویی و ساخت بادکنک گاز هلیومی وجود دارد. یکی از حقایق زیبا و جالب شیمی واکنش جوش‌شیرین (NaH­CO₃) و سرکه (CH₃­COOH) که مقدار زیادی گاز کربن دی‌اکسید آزاد می‌کند. صدالبته، بادکنکی که با کربن دی‌اکسید پر می‌شود، قادر به پرواز نیست، اما می‌توان افزود که این آزمایش بدون شک علاقه‌مندی به شیمی را در بر دارد و از آن گذشته، می‌تواند سرآغاز آزمایشات و تجارب بی‌خطر شیمیایی در خانه باشد. این حقه، یا کلک علمی را به کودکان نمایش دهید و از این طریق شگفتی آن‌ها را برانگیزید که چه گونه یک بادکنک می‌تواند از طریق یک بطری باد شود. همان‌طور که ذکر شد این از دسته‌ی راه‌هایی است که می‌تواند منجر به علاقه‌مند ساختن افراد از سنین کوچک به علم شود. انجام این کار بسیار ساده است؛ به حدی که یک کودک هم از پس انجامش برمی‌آید؛ اما باید جانب ایمنی را رعایت کرد و حتماً دستکش به دست داشت؛ زیرا سرکه‌ی قوی می‌تواند آثار نه‌چندان جالبی روی دست داشته باشد و حتی باعث سوختگی شود. باید به خاطر داشته باشید که شرایط آزمایش به‌نوعی شبیه کار کردن با مواد اسیدی است (البته از نوع ضعیف) و کودکان حتماً باید با حضور بزرگ‌سالان به انجام این آزمایشات بپردازند. دو قاشق جوش‌شیرین در بادکنک بریزید؛ و نصف یک لیوان استیک اسید (جوهر سرکه) در بطری. توجه داشته باشید که جوش‌شیرین زیادی نریزید. حالا بادکنک را روی بطری قرار داده به‌طوری‌که لب‌به‌لب شوند. به این طریق جوش‌شیرین به درون سرکه می‌ریزد و واکنشی شیمیایی با خروج کربن دی‌اکسید آغاز می‌شود. نتیجه‌ی این امر؛ باد شدن بادکنک خواهد بود. البته به دلیل ضعیف بودن واکنش بادکنک چندان پرباد نخواهد بود. توجه داشته باشید اگر می‌خواهید واکنش را قوی‌تر انجام دهید استفاده از نمک و سرکه‌ی بیشتر راهگشا خواهد بود. در این آزمایش می‌خواهیم یک بادکنک را به پرواز درآوریم؛ اما ازآنجایی‌که امکان آتش‌سوزی وجود دارد، باید آن را در فضای باز انجام داد. برای انجام این آزمایش به عینک آفتابی؛ دستکش و لباس آزمایشگاهی؛ به منظور حفاظت از خود احتیاج خواهید داشت. یک قمقمه یا فلاسک شیشه‌ای. البته شاید برای انجام این آزمایش به کمک یک نفر دیگر هم احتیاج باشد؛ و البته برای ماده‌ی خاص این آزمایش که همان سدیم هیدروکسید خالص است؛ شما باید به مغازه‌های ابزارفروشی مراجعه داشته باشید. سعی کنید تا حد امکان خالص این ماده را تهیه کنید و با این حرف که فلان ماده هم سدیم هیدروکسید در مقادیر بالا دارد قانع نشوید. ابتدا با استفاده از فویل آلومینیومی، ۱۰ قطعه دایره‌ی کوچک درست کرده و در ابتدای بطری یا فلاسک قرار دهید. سدیم هیدروکسید را بریزید و بعدازآن آب را اضافه کنید. یک نصف لیوان کافی است (برای یک بسته سدیم هیدروکسید). حالا تمامی قطعات آلومینیومی را که ساخته‌اید درون محلول بریزید؛ اما محلول را تکان ندهید زیرا واکنش تسریع می‌شود و گاز زیادی تولید می‌شود. اگرچه بادکنک پربادتر می‌شود اما باید توجه داشت که هم‌زمان سنگین‌تر از حد لازم هم می‌شود و این یعنی عدم پرواز. درنتیجه؛ اگر کار را درست انجام داده و محلول را تکان ندهید. بادکنک آرام باد می‌شود و شما می‌توانید صحت روند را بررسی کنید. پس از چندی بادکنک به پرواز درمی‌آید و اثر گاز معادله‌ی مذکور دقیقاً مشابه استفاده از گاز هلیوم خواهد بود. ورزش قدیمی و شادی‌آور بالون‌سواری و به بیانی پرواز هیجان‌انگیز بالون‌ها، امروزه در ایالات‌متحده با سرعت قابل‌توجهی رنگ می‌بازد. شاید یکی از مهم‌ترین علت‌ها پرهزینه درآمدن این ورزش به سبب قیمت بالای گاز هلیوم باشد. این ورزش معمولاً با مسافتی که بالون‌سواران می‌پیمایند مورد ارزیابی قرار می‌گیرد (هر فردی که مسافت بیشتری طی کند برنده است) و درنتیجه هر مسابقه دو تا سه روز به طول خواهد انجامید. برخلاف بالون‌هایی که با هوای گرم کار می‌کنند؛ همان‌طور که از نامشان مشخص است، بالون‌های مذکور را گاز هلیوم یا هیدروژن به کار می‌اندازد. البته به سبب برخی محدودیت‌ها و قابلیت فوق‌العاده بالای هیدروژن در مسابقات بالون‌سواری امریکا تقریباً از هیدروژن در هیچ جا استفاده نخواهد شد. بله شاید هزینه‌ی پر کردن یک باک از گازوئیل این روزها بالا باشد، اما باید توجه داشت که رها کردن یک بالون از گاز هلیوم می‌تواند تا ۱۲ هزار دلار آب بخورد؛ و این تنها هزینه‌ی گاز است. خرید یک بالون گازی تقریباً ۳۰ هزار دلار هزینه دارد. این در حالی است که هزینه‌ی پر کردن یک منبع گاز هلیوم، دو یا سه سال پیش ۳ هزار دلار بود. بدون شک، قیمت گزاف این ورزش، علت به انزوا رانده شدن این ورزش یعنی، بالون‌سواری با گاز است. تخمین زده می‌شود که ۵۰۰۰ هزار بالون در ایالات‌متحده وجود داشته باشد و البته از این تعداد کمتر از یک‌دهم آن‌ها، بالون‌های گازی‌اند. یکی از مهمترین دلایل گران بودن این ورزش، قیمت بالای گاز هلیوم است. این قیمت بالا هم می‌تواند در اثر افزایش درخواست و تقاضای سایر بخش‌ها برای گاز هلیوم باشد. کمپانی Praxair Inc که در صنعت تولید گازها فعالیت دارد، تصریح می‌کند که امروزه گاز هلیوم در ساخت ریزپردازنده‌ها، قطعات الکترونیکی، صنایع فضایی و صنعت پزشکی، مورداستفاده‌ی وسیع قرار می‌گیرد. گاز هلیوم را به‌نوعی می‌توان محصول جانبی تولید گاز طبیعی دانست؛ و ازآنجاکه صنعت تولید گاز طبیعی در سال‌های اخیر با مشکلاتی مواجه بوده طبیعی است که قیمت گاز هلیوم هم بالا رفته است. البته، این شرایط گران، بیشتر راجع به امریکا صدق دارد و در اروپا صادق نیست (در اروپا ارزان‌تر از امریکاست). به‌عنوان‌مثال Troy Bradley از نیومکزیکو، به همراه یکی از دانش‌آموزانش، به آلمان پرواز کرد. وسیله‌ی پرواز او یک بالون هلیومی بود. یکی از کمپانی‌هایی که به قیمت گاز هلیوم حساس است؛ کمپانی Macy’s Inc است. این شرکت که روز شکر گذاری را همه‌ساله برگزار می‌کند، برای زینت بخشیدن به مراسمش از بالون‌های غول‌پیکر استفاده می‌کند. مراسم این شرکت در نیویورک برگزار می‌شود. اخیراً سخنگوی این شرکت، صحبت‌هایی در همین باره، یعنی افزایش قیمت گاز هلیوم ایراد کرده بود. و اما یکی از علاقه‌مندان به بالون‌سواری که البته نخواست نامش فاش شود، تجربه‌ی خود از قیمت هر بار باد کردن یک بالون هلیومی را این‌گونه اظهار می‌کند. با توجه به هزینه‌های تست و آزمایش قبل از پرواز و البته برای بالون‌های سایز بزرگ، هر بار چیزی در حدود ۴ الی ۵ هزار دلار هزینه می‌شود. بسیاری از فعالان و اصطلاحاً بالونیست ها معتقدند برای بقای این ورزش، تنها راه مجاز دانستن استفاده از هیدروژن است. در همین راستا Bert Padelt طراح و سازنده‌ی بالون‌های هوای گرم و همچنین گازی، معتقد است که Hindenburg و ترکیدن بالونش (که هیدروژنی بوده) باعث تعطیلی استفاده از بالون‌های هیدروژنی در ایالات‌متحده شده است. او (Hindenburg) هوانوردی بود که با بالون و کشتی‌های هوایی به مسافرت می‌پرداخت. البته در سال ۱۹۳۷ در نیوجرسی و در هنگام فرود، دچار سانحه شد و بالونش آتش گرفت. درنتیجه‌ی این اتفاق، قانون‌گذاران امریکایی از ترس رویدادی مشابه؛ و حوادث ناشی از اشتعال هیدروژن، امکان پرواز با این گاز را از بین برده‌اند. البته، جدای از مسئله‌ی خطر، اکثر بالون‌سواران به دنبال یک پرواز آرام و درنهایت سکوت هستند؛ زیرا زیبایی پرواز را در این مؤلفه‌ها جست‌وجو می‌کنند؛ و اما به‌عنوان‌مثال؛ در آلمان؛ پرواز با هیدروژن سال‌های سال است که ریشه دوانیده و مورداستفاده قرار می‌گیرد و لذت افراد علاقه‌مند را فراهم آورده است. یک طراح بالون به نام Padelt گفته است که: بیایید با این مسئله روبه‌رو شویم. سوخت آینده به‌احتمال‌زیاد حتی در روی جاده‌ها، احتمالاً هیدروژن خواهد بود. درنتیجه باید کار با آن را فراگرفته و آموزش‌های مربوط به آن را آغاز کنیم. آیا واقعاً داریم هیدروژن را تمام می‌کنیم؟ این سؤالی بود که از مرکز تحقیقاتی Quora و متخصصان آن پرسیدیم. اینا ویشیک، فیزیکدان از مرکز مطالعاتی Quora به سؤالات زیر پاسخ داده است. بله واقعاً داریم گاز هلیوم را تمام می‌کنیم. هر شخصی در هر حوزه‌ای از محصولاتی استفاده می‌کند که به‌نوعی گاز هلیوم مصرف می‌کنند؛ و با این گستردگی مصرف؛ تقریباً راهی برای تولید کم‌هزینه‌ی گاز هلیوم وجود ندارد. بسیاری از مردم نمی‌دانند که گاز هلیوم عنصری غیرقابل‌تجدید است. این عنصر تولیدشده و ناشی از واکنش‌های هسته‌ای و اورانیومی است؛ و از معادن و زمین حاصل می‌شود. به مجردی که گاز هلیوم وارد اتمسفر شود بازیافتش صرف اقتصادی ندارد زیرا بسیار سبک است و در ارتفاعات بالا یافت خواهد شد. این چالشی است بزرگ که عده‌ی زیادی که دور از صنعت فوق هستند، دیدی نسبت به آن ندارند. با توجه به این حقیقت و اطلاعات داده‌شده، باید گفت که دولت ایالات‌متحده تدابیری اندیشیده است. از سال ۱۹۶۰ ذخیره‌سازی گاز هلیوم در مرکز ملی انباشت هلیوم به نام Bush Dome آغازشده است. این مکان انباری است عمیق در تگزاس که در اواسط دهه‌ی ۷۰ میلادی بالغ‌بر ۱.۲ میلیارد مکعب گاز هلیوم را در خود جای‌داده بوده است. البته میزان ذخیره‌ی فعلی در حدود ۰.۶ میلیارد مکعب یا معادل ۴ برابر نیاز بازار در امروز است. در ۱۹۹۶ سیاست ذخیره‌سازی گاز هلیوم در ایالات‌متحده دستخوش تغییر شده بود و هدف این بود که تا ۲۰۱۵ گاز هلیوم ذخیره‌شده به فروش برسد؛ و درنتیجه‌ی این سیاست، ایالات‌متحده ۴۰ درصد از بازار گاز هلیوم دنیا را زیر قیمت در اختیار گرفت. این‌طور که Chan می‌گوید این سیاست منجر به دلسردی در امر اکتشاف گاز هلیوم گردید. از گاز هلیوم به‌عنوان یک مخلوط سردکننده در دستگاه‌های MRI استفاده می‌شود. این را باید مهم‌ترین و شایع‌ترین استفاده از گاز هلیوم به‌عنوان یک سرما ساز معرفی کرد. البته راه‌ها و پیشرفت‌هایی مشاهده‌شده است که نشان می‌دهد می‌توان در آینده از گازهای هیدروژن، اکسیژن و نئون برای سردسازی MRI ها استفاده کرد؛ اما بعید است که این جایگزینی در آینده‌ای نزدیک مشاهده شود. هلیوم گازی است که به‌طور گسترده در جوشکاری‌ها مورداستفاده قرار می‌گیرد. به نظر من می‌توان گاز بی‌اثر دیگری را جایگزین کرد؛ اگر واقعاً گاز هلیوم رو به اتمام است. گاز هلیوم به‌عنوان نوعی هادی نیمه‌رسانا در صنعت مورداستفاده قرار می‌گیرد و دمای اعضای صنعتی را کاهش می‌دهد. گاز هلیوم در صنایع مختلف؛ به‌عنوان گاز نشتی یاب مورداستفاده قرار می‌گیرد. این ویژگی به دلیل قابلیت عرض‌اندام این گاز در فشارهای خیلی پایین و خیلی بالا است؛ یعنی در صنایعی که دقت فوق‌العاده زیادی موردنظر است، برای یافتن هر نشتی یا ترک ریزی، می‌توان از گاز هلیوم استفاده کرد. بسیاری از آزمایش‌های علمی به هلیوم مایع نیاز دارد. این مطلب به این دلیل است که هلیوم می‌تواند پایین‌ترین دماهای ممکن را برای شرایط آزمایشی پدید آورد. و اینکه گاهی هلیوم جز جدایی‌ناپذیر یک آزمایش علمی است و بدون آن کار ممکن نیست. تجربه‌ی شخصی من این را ثابت می‌کند؛ زیرا بعضاً هفته‌ها منتظر هلیوم بودم تا یک آزمایش را انجام دهم. اعمال سیاست‌ها مناسب در زمینه‌های اکتشاف و انبار سازی. به‌طوری‌که نه اکتشاف افسارگسیخته ممکن باشد و نه فروش زیر قیمت. در همین راستا به‌عنوان‌مثال کارهایی انجام‌گرفته و در سال ۲۰۱۳ ایالات‌متحده فروش زیر قیمت گاز هلیوم را ممنوع ساخت. استفاده‌ی بهینه از منابع گاز هلیوم و البته توجه به راه‌های ممکن برای بازیافت این گاز. این امر مخصوصاً راجع به صنایع و کارخانجاتی که به‌طور گسترده از گاز هلیوم استفاده می‌کنند می‌تواند صدق کند. به‌عنوان‌مثال LHC. البته آزمایشگاه‌های جدید هم در حال حرکت به همین سمت‌وسو هستند (مثل جایی که من کار می‌کنم). احتمالاً هزینه‌ی اولیه‌ی پرداختن به راه‌های بازیافتی زیاد به نظر می‌آید (over $100K) اما باید توجه داشت که این سرمایه در طول چند سال از محل صرفه‌جویی به‌راحتی قابل جبران خواهد بود. باید توجه داشت که امکان تولید گاز هلیوم بیشتر زمانی که تمام آن را از زمین استخراج‌کنیم وجود نخواهد داشت. تمامی روش‌هایی که برای تولید گاز هلیوم بیشتر در این صورت پیشنهادشده است؛ به طرز غیرقابل‌باوری گران و فاقد هرگونه صرفه‌ی اقتصادی هستند (مثلاً یکی از روش‌های پیشنهادشده که البته بسیار غیرمنطقی است اکتشاف گاز هلیوم در ماه و انتقال آن به زمین است، روش دیگر تغییر در ساختار داخلی اتم‌های دیگر و شبیه‌سازی آن‌ها به هلیوم است). درنتیجه مشکل تمام شدن هلیوم شبیه به اتمام نفت نیست؛ زیرا در حال حاضر گزینه‌های زیادی برای جایگزینی آن وجود دارد. البته لازم به ذکر است که در بسیاری از مواردی که امروزه هلیوم مورداستفاده قرار می‌گیرد؛ هیچ جایگزین دیگری نمی‌تواند مورداستفاده واقع شود. توجه: تا سال ۲۰۰۸ قریب به ۷۸ درصد گاز هلیوم زمین توسط ایالات‌متحده استخراج و انبار شده بود؛ و دلیل پرداختن من به گاز هلیوم و آوردن مثال‌هایی از امریکا این بود که هلیوم با نام این کشور گره‌خورده است. پیش‌بینی می‌شود که در حدود ۲۵ درصد از گاز هلیوم استخراج‌نشده‌ی زمین، اکنون در خلیج‌فارس مدفون باشد.